Are you feeling stuck in your work right now? If you are, Shawn Askinosie has some unconventional advice for you. He believes to get unstuck you need to feel your pain, so you can understand your calling. 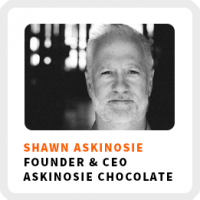 Shawn is the founder and CEO of Askinosie Chocolate, a bean to bar company he started after leaving a successful 20-year career as a criminal defense attorney. And by the way, it took him 5 years to find his next calling. He ended up writing a book about that struggle, Meaningful Work: The Quest to Do Great Business, Find Your Calling and Feed Your Soul. Why you find your next thing in the “valleys” of your career. The steps Shawn took to lead him through this transition from his career as a lawyer toward his current calling as a chocolate maker. How helping others will help you find your calling. How farming helps to connect people and businesses. This episode is filled with so much profound coaching advice, I decided not to do my usual Coaching Advice segment toward the end of the show to just let Shawn keeping talking! This guy gets it in such a deep way! Regains focus by: Doing his morning routine of stretching, praying, reading, and meditating. 90-day goal: Surrender into the unknown for the business.